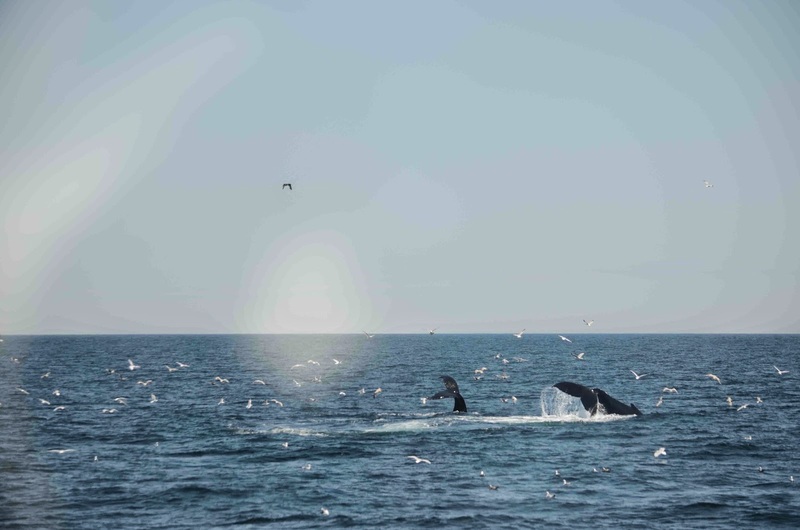 This morning on the 10am whale watch on board the Cetacea we headed out to the western edge of Stellwagen Bank for an amazing whale watch. As we approached the area we could see a line of blows as animals were feeding along the edge of the bank. 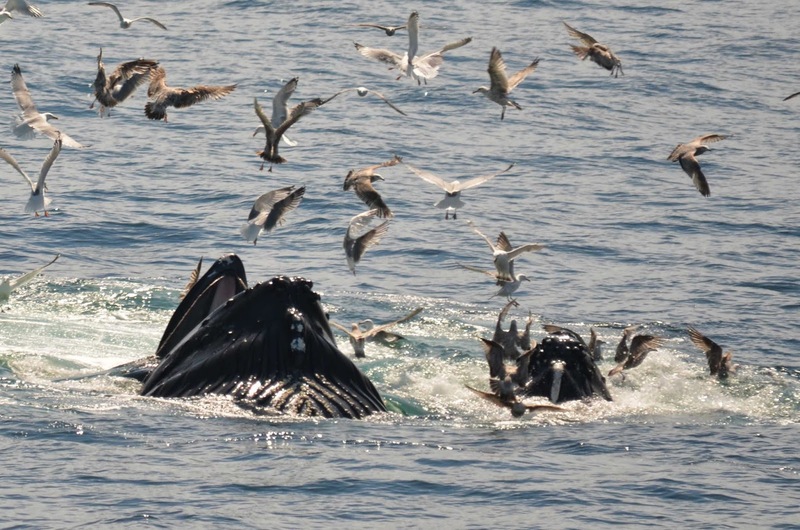 There were probably 20-30 humpback whales in the area. The first group we found turned out to be a great look at Nile and Milkweed feeding together while their calves hung out at the surface. One of the calves even did a headstand under the water right next to the boat! As all this was happening, I noticed something strange off the side of the boat, it was a basking shark! This shark is the second largest fish in the ocean and can reach lengths of 20-26 feet long. 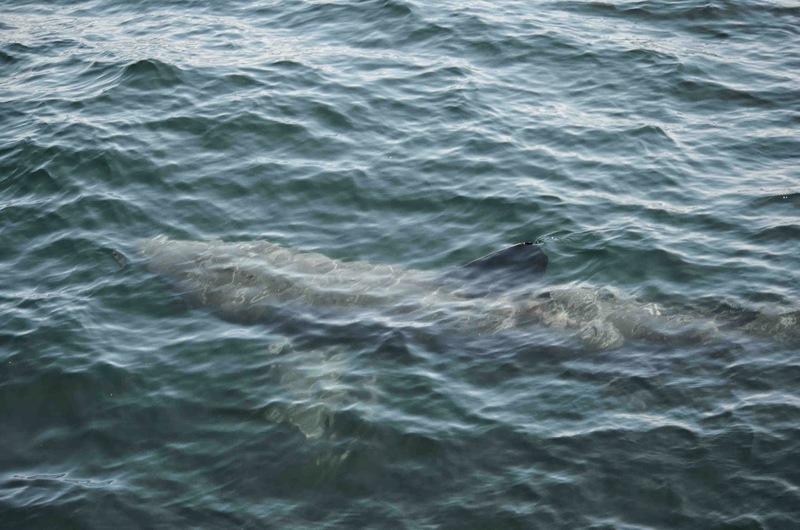 This was a great sighting of this animal coming right alongside the boat and it was actually my first basking shark sighting! We then moved on to a large group that was bubble feeding together. It was hard to identify every animal in the group as they didn’t seem to fluke very often; maybe they aren’t diving as deep to find fish. But this group seemed to be made up of Hancock, Geometry, Tongs and her calf, and a fourth whale which the only fluke photo of has a very inconsiderate sea gull obscuring the fluke! We stayed with this large group for some time and Tongs and the unknown whale left and Jabiru, Pepper and Daffodil joined up with Hancock and Geometry to engage in some more bubble feeding and great open mouth lunges! Off the distance there was also a lot of activity going on with some great kick feeding from Glo-stick and Milkweed. As these females were feeding the calves were also mimicking this behavior and Glo-stick’s calf in particular was doing a lot of tail lobbing and even showed off some breaches (see pictures above)! We started to head home and came across a surprise bubble net which turned out to be Wizard and her calf. This afternoon continued the amazing couple weeks we have had on the water! 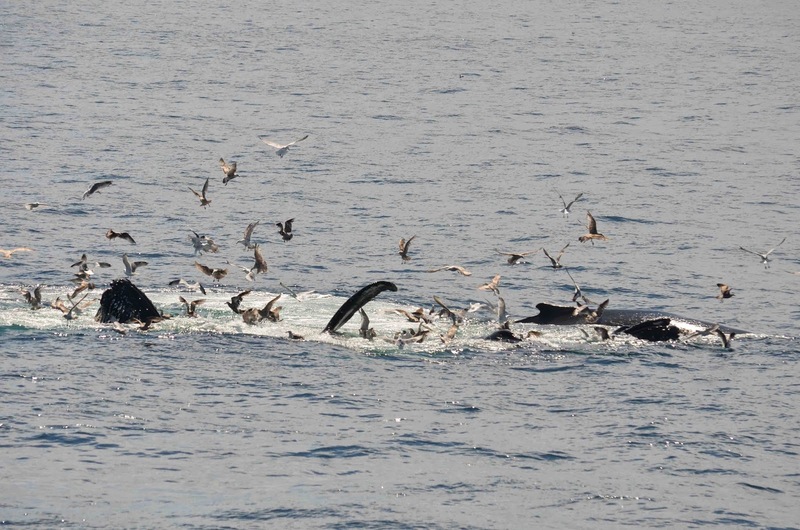 We have seen so much feeding activity on Stellwagen Bank and this afternoon was no exception. In fact, I don’t think I have ever seen so many whales in one place. I certainly have never identified so many individuals at one time in one place. We saw six mother and calf pairs alone including Milkweed, Nile, Tongs, Tornado, Glow-stick, Vulture and each of their calves! 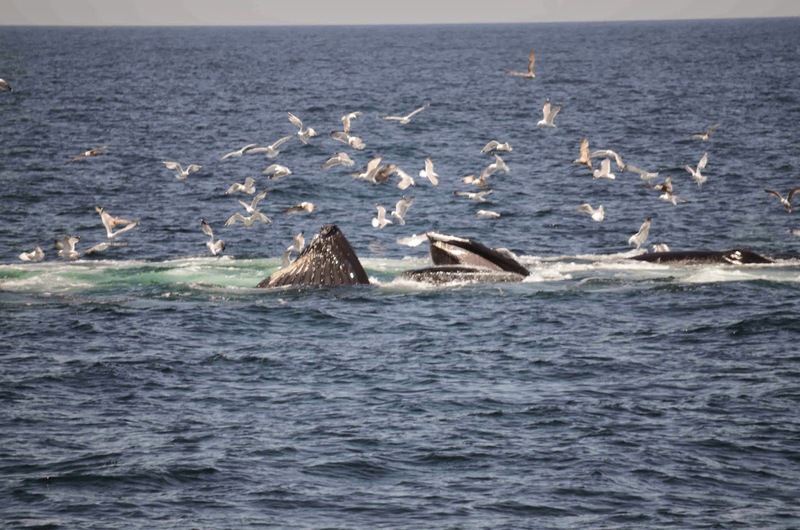 We also saw Pepper, Geometry, Daffodil, Samara, Hancock, Springboard, Aswan, Grackle and Osprey making a total of 21 different humpback individuals. There were even more humpbacks in the distance but we just couldn’t get to all of them! 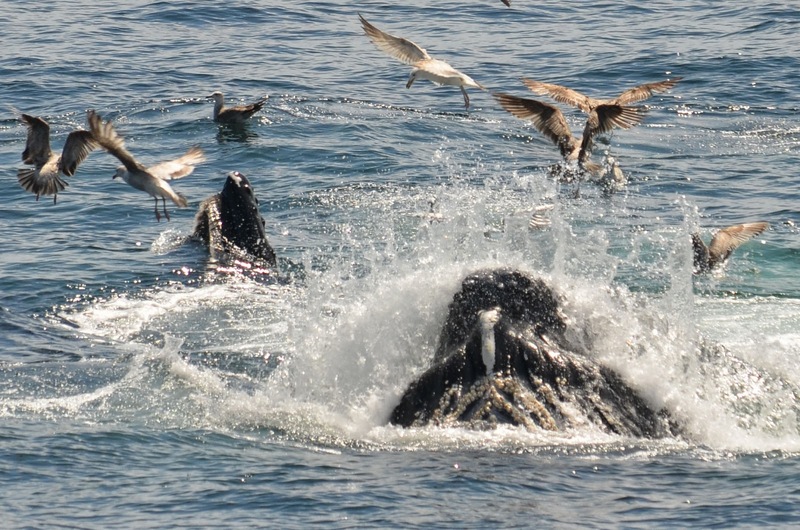 We saw lots of bubble net feeding and a few whales kick feeding as well. 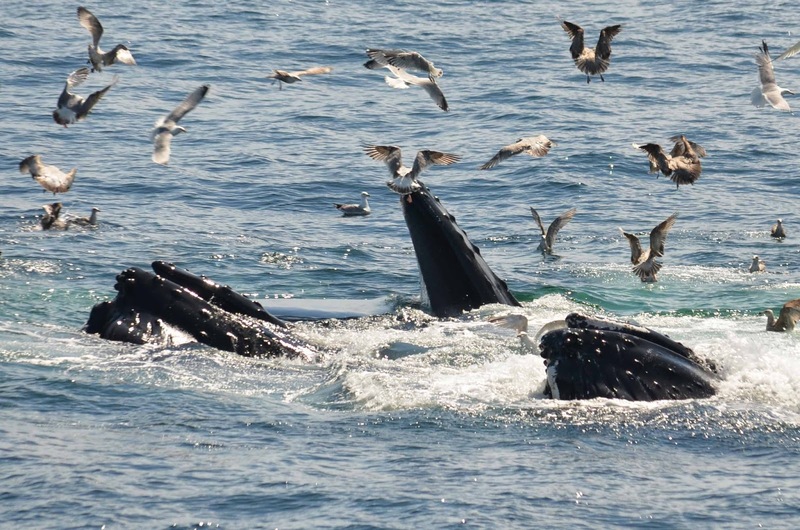 These whales all fed in various temporary groups creating what we call associations. These associations lasted from 5 to 20 minutes as bonds were formed and broken throughout different feeding activities. Our intern Lindsey and I tried our very best to collect behavioral data accurately and keep track of all these groups as they played a sort of musical chairs. 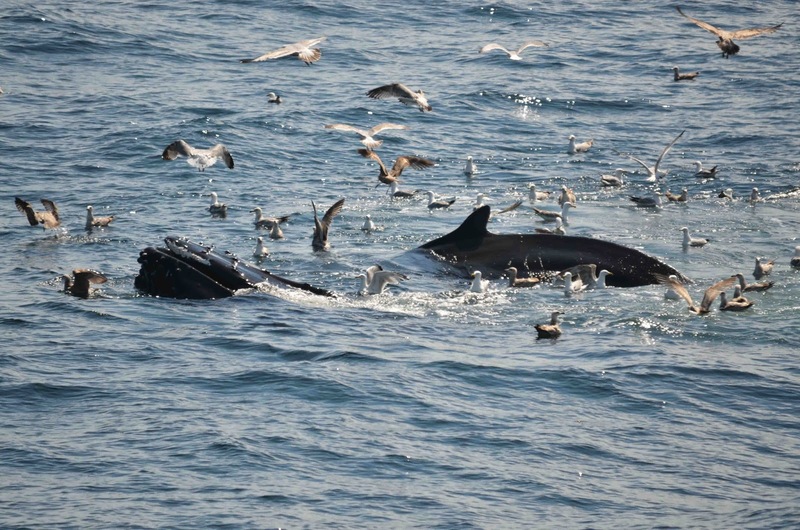 It was incredibly exciting to see so many whales feeding in one place! We hope that our guests have been enjoying our amazing trips as much as we have!